Dean utilizes a unique blend of bodywork and massage techniques during his sessions. He customizes the techniques used on a session according to each individual client's physical condition. The work is performed through clothing. As a result, disrobing is unnecessary. Please arrive to your appointment in comfortable clothing. 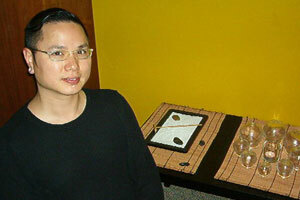 Dean Woo's Asian Bodywork and Massage combines acupressure with energy work. Dean is uniquely trained and qualified through years of Sensitivity Training to the Relationship Between Breath, Energy and The Release of pain and blockage In the Body. He is aware of the life force (chi) that flows in and through all things. At 9 years old he began the serious study of Buddhist chanting. As Dean studied martial arts, he learned to move energy through his own body. After he completed his formal instruction in Davis, California at Julie Stenzel's school "Massage Therapy Institute", he immersed himself deeply in Kung-Fu and chi-gong breathing in his healing work. Infusing breathing, form, and balance into every activity, Dean finds the points of blocked chi in the body and moves chi through the body. Thus, the body is cleansed, invigorated and energized. Dean's work is subtle and yet profound. Try it out for yourself.